Cannibalism in mosquitoes, what a fun and exciting topic you chose today! As you and I are well aware by now, a mosquito will try to bite anything that is alive. But what if that biting frenzy goes a bit too far? Can a mosquito bite another mosquito? As you might know, it’s mostly the females that want to bite for blood, perhaps the male mosquitoes can be a good target for them? After all, spider females do the same thing after mating with a male spider. Let’s find out if a mosquito likes to bite its own species as well. See that cloud of insects buzzing around in the image right above here? I’ve often wondered why they never bump into each other, or why a fight never breaks out between them. That’s where I usually get bored and start frantically slapping them with this extra large electronic bug zapper I just got from my buddy Jeff Bezos. It makes them smell nice and crispy, almost like bacon. That will surely make them want to eat one another, right? All jokes aside, if it’s still light outside, just look outside for a bit and see if you can spot one of these mosquito clouds yourself. You probably can, because our buzzing friends are everywhere these days. Can you already spot them biting each other like cannibalistic maniacs that they are? Look closely, and take your time if you must. Perhaps you will come to the same conclusion as I did. Do Mosquitoes Bite Each Other? No matter how long you observe mosquitoes, you will never find them biting each other. That is because adult mosquitoes will never bite their own species for blood. However, mosquito larvae are known to bite and even eat each other in some mosquito species. The biting mechanism is saved for mammals like you and me. So it turns out that the mosquito larvae are actually a lot more dangerous to their own species than the adults are. For mosquitoes, it’s actually true if you say that “with age, calmness and wisdom comes to you”. It must be noted that during the larvae stage, female mosquitoes will not have developed their biting mechanism yet. Female larvae, as well as males, will maul each other to death regardless of their gender (to save themselves from the same fate). It is only once they survive this tough childhood, they project their psychological problems onto us in the form of sucking our blood. That is, of course, an over-exaggeration, but it is true that adult mosquitoes are actually pretty nice towards each other. Well, generally speaking of course. They dance around in the evening in your garden but will go hunting for blood at night. The little vampires that they are. But to be fair, the little ones are worse. Mosquito larvae are known to be cannibalistic from birth, but only in some species. The cannibal mosquitoes are of the varieties called Toxorhynchites (elephant mosquitoes) and Psorophora (largest known mosquitoes). They are not cannibals by choice, but it is a larvae survival mechanism. Adult mosquitoes will never try to eat one another. The species mentioned, which are of the cannibalistic variety, are actually one of the few species in which the females will bite humans or other animals. The large mosquitoes might seem dangerous, but they are only so as tiny children, when they play survival of the fittest in their little puddles of death and destruction (the pools in which they are born). As little larvae, the area in which they are born (often in a small pool of non-flowing water) can be quite cramped. This means that usually, food supply is low. Their parents will not take care of them after birth, they’re not birds that get spoonfed until they can fly. So what do you do as a hungry little larva that wants to live? You eat your brothers and sisters in an attempt to stay alive. This might seem cruel, but much like any living thing, a mosquito will need the energy to keep going. In a small pool of water, there might not be many alternatives, making the act of cannibalism seem like the most logical option. For humans, this is actually the preferred thing for mosquitoes to do, as it results in fewer insects overall. Despite this, the mosquitoes that do survive, will be among the most active and determined little flying monsters you can find. Do Mosquitoes Bite Other Insects? Yes, mosquitoes can bite other insects, much like they are sometimes cannibalistic in nature. However, insects will never be the prime target of mosquitoes, as they do not provide the necessary blood characteristics other species (such as humans) can provide to them. Mosquitoes bite others to lay eggs, so they will always attempt to find the optimal target. The blood characteristics of insects can be quite different from humans, other mammals, birds or amphibians, which are actually the prime targets most of the time. It must also be noted that the males will be happy to stay with their nectar, while females are the ones doing all the heavy lifting, i.e. the hunting part of the job. This does not mean that other insects are safe from some of the larger species, which can be aggressive or even lethal to them at times. This is the type of behavior that you will probably not often see in your friendly neighborhood garden, but it can certainly happen. Nevertheless, biting other insects is more of a self-defense mechanism, more than anything else. 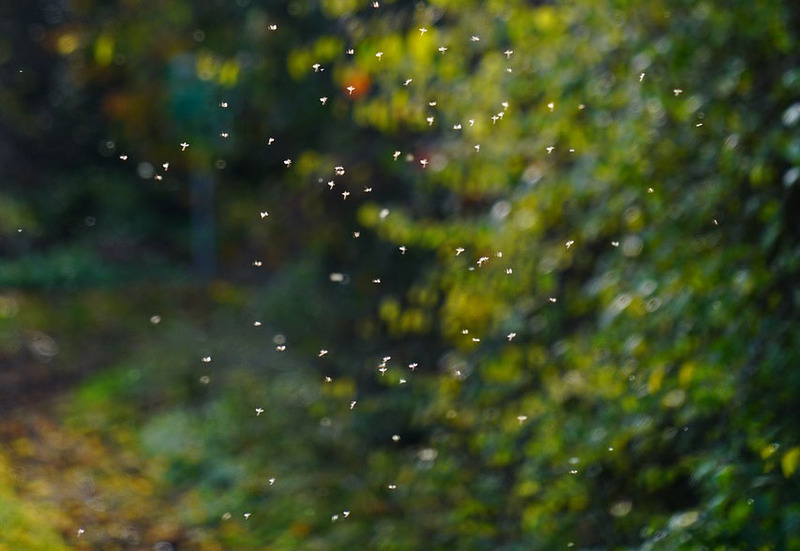 The intention of attacking insects will never be the act of reproduction and laying eggs, which is the primary reason mosquitoes will bite humans (and other animals) in the first place. Only when their habitat is threatened, or if they actively get bothered by other insects, the larger varieties will sometimes attack and kill any unwanted intruders. As for other animals, however, the list of species on the menu (for sucking their blood) is pretty impressive. Let’s briefly take a look at some of the most commonly bitten animal species. What Animals Do Mosquitoes Bite? And any other large wildlife species you can imagine! Well, there you have it. You will now forever see mosquitoes for what they really are. Really tiny flying monsters, psychologically traumatized by institutionalized child-cannibalism, turned into blood-sucking little vampires. That’s a big mouthful to say out loud. I hope not a mouth full of insects, because that’s somewhat gross. We now learned that our little cannibal vampires aren’t interested in insect blood after all. They only want mammal blood, especially human blood. All we can do against that is fight back. If you want to learn how to never get bitten by these little cannibals again, you should check out some of the tests and reviews on this page. Those products can arm you pretty effectively against the army of insects that want your blood. I’ve tested them personally, and it works. Also, if you enjoyed some of the thought experiments we explored together in this article, I’ve got another great one for you to check out: Can a mosquito get drunk if it bites a drunk person? That’s one of the better questions one could only come up with once they are already a bit intoxicated themselves. The answer to that one might actually surprise you, so certainly make sure to give it a read.